I read today that Ebert and Roeper gave The Passion of the Christ two thumbs up. “Mel Gibson is a masterful storyteller, and this is the work of his lifetime,” Roeper said. I don’t know how significant that is in the long or the short term, but it was interesting to see given the status those guys have in the realm of American cinematic discourse. I guess it interests me for the same reason that I chose the banner up top that includes Michael Medved’s quote (rather than Billy Graham’s or the Pope’s or those of several other famous Christians). I think it’s worth noting that reputable film critics without a dog in the fight consider this a very good film. There’s so much shouting going on about whether the existence of The Passion is good or bad for society, and it seems like heads get less and less level with every day that passes. I get the sense that people are digging in based on their assumptions and agendas and not giving the film a chance to just be a film. Jewish opponents of the film think it’s dangerous propaganda. Christian advocates of the film call it “the greatest tool for evangelism in 2,000 years” (and we’ll chalk the elevation of a Mel Gibson film over the New Testament up to a well-intentioned, if overzealous subculture). Unfortunately what could be a very healthy and helpful dialogue has deteriorated before it’s even started in many corners. That’s a shame. Here’s my other beef. People can just be silly and, well, stupid. I read this quote in a CNN story from a woman who saw the film on Wednesday: “I think it is, in a way, Hollywood’s interpretation of something,” she said. “And I’m not quite sure of the ultimate purpose, because I do feel it is extremely graphic and somewhat biased.” No kidding. News flash — a movie based on the Bible made by a professing Christ-follower about the death of Jesus is biased. Oh, and that’s bad. I suppose she’d prefer to see an “unbiased” portrayal of Jesus being tortured and nailed to wooden beams. I have no idea what that means, but maybe it involves some Moonies and Martians and Portuguese lesbians standing around the cross and giving their alternative points of view about life and salvation. Sounds like a great movie. Somebody call Alec Baldwin. Look, I don’t expect everyone to love Jesus, and I don’t expect everyone to love me because I love Jesus. I understand and embrace life in a pluralistic world. What makes absolutely no sense to me is this notion that we need to sanitize ourselves to some mythical land of unbiased vanilla. Let’s all pretend that we don’t believe anything that might possibly conflict with or threaten someone else’s beliefs. And that’s the first problem with that nonsense — it’s all pretend. It’s a fairytale. People believe, and they believe lots of different things in lots of different ways. Quit trying to run from it. This is not about my oppressive and exclusive religion. 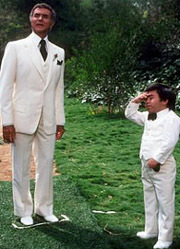 It’s about all of us (and Christians need to learn this too) dealing with reality rather than trying to conjure up Fantasy Island where everyone pretends not to notice the fairly noticable difference between Tatoo and Mr. Roarke. My other major problem with this absurd push for a world of eternal neutrality is that it’s boring as hell. Okay, so that’s a poor choice of words since it would be hypocritical for me to pretend that hell is boring in the midst of a rant like this. But you get the point. I don’t care what you believe or don’t believe – who really wants to live like that? I’ll take passionate people who disagree with me over a bunch of lifeless newts who don’t believe anything at all. So anyway, here’s my moment behind the pulpit on the eve of the film’s release — Let it be what it is. It’s a film. It’s art. It’s an imaginative visual depiction of the gospel accounts of the final twelve hours of the life of Christ. It isn’t the Bible, nor is it an interfaith story about why all religions are equally valid paths to God. It’s important and it’s worth seeing for all kinds of people, Christian and non-Christian. Read the film, don’t just receive it. Give it an avenue into your brain and your soul. There’s no reason to avoid that, no matter who you currently say that Jesus is. If he’s Lord, you should want the deeper encounter. If he’s not, your soul has nothing to lose. Whatever you do, don’t get into a shouting match with anyone. Jesus never dragged anyone into the Kingdom by the throat, and you aren’t going to one-up Him in that regard.